The basic product concept is of maintaining eye health. The product consists of a sweet potato base supplemented with a balanced formulation of domestically grown black carrot, a classic functional vegetable with high nutrient value, and astaxanthin. It is made with coconut oil, which has zero trans fatty acids, and contains none of the seven major allergens (wheat, milk and eggs) making it perfectly safe for pets with food allergies. 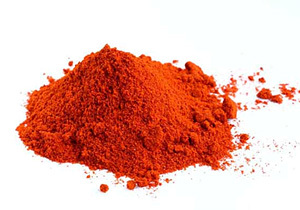 Astaxanthin belongs to the class of natural pigments called carotenoids, noted for their powerful antioxidant properties. Astaxanthin has 1,000 times more Vitamin E and 100 times more beta-carotene than other carotenoids, and is an excellent way to keep your pet’s eyes in good condition. The functional vegetable black carrot has been dubbed a super-food on account of its high levels of nutrients, as well as antioxidant anthocyanin and polyphenol not found in ordinary carrots. Antioxidants are one of the key weapons in the fight against aging. Black carrots are 28 times more effective than ordinary carrots at turning back time. They also have a number of health and beauty benefits. The product also contains medicinal CPL (cyclic poly lactate) to boost absorption of these two important ingredients. Astaxanthin is a red carotenoid pigment and powerful antioxidant that is commonly found in seafood (particularly salmon and salmon roe) and seaweed. These see species feed on haematococcus seaweed, which contains natural red pigment. Salmon eat large quantities of the seaweed in order to stockpile astaxanthin to provide energy for the arduous upstream journey against swift river currents during the spawning season. The astaxanthin extracted from haematococcus seaweed is very highly concentrated—around 3,000 times the quantity of the salmon. Eyestrain is a form of muscle fatigue caused by prolonged extension of the retinal muscles at the back of the eye. Astaxanthin dilates the blood vessels, allowing more blood to flow through the peripheral vessels around the eye. The improved blood flow aids recovery of the retinal muscles and helps to reduce fatigue, which is an effective way to promote recovery from eye strain. Astaxanthin alleviates tiredness by suppressing production of peroxidized lipids that causes fatigue. It also alleviates muscle fatigue by suppressing production of lactic acid that causes muscle fatigue. The key characteristic of astaxanthin is its powerful antioxidant effect, which suppresses active oxygen. Astaxanthin prevents active oxygen from oxidizing the proteins, fats, DNA and other materials required to make various types of body tissue, and this in turn helps to prevent a range of diseases. The anti-oxidizing power of astaxanthin is reported to be around 1,000 times stronger than Vitamin E, 40 times stronger than beta-carotene and more than 1,000 times stronger than the coenzyme Q10. Astaxanthin is an enzyme used to produce melanin. It also hinders the activation of tyrosinase, and suppresses the tendency of active oxygen to destroy collagen in the presence of ultraviolet radiation. The antioxidant effect of astaxanthin prevents oxidization of cholesterol in the blood. Black carrots, commonly found in Central Asia, are a type of Panax from the carrot family. Black carrots have a long history. They were first grown in Afghanistan about 3,000 years ago. They can only be grown under certain special conditions and are considered a highly prized rarity around the world. 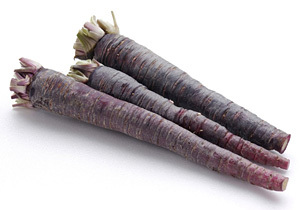 Black carrots boast much higher content of antioxidants than ordinary carrots. There is increasing interest in the health and beauty benefits of black carrots, particularly in Europe. Black carrots contain beta-carotene and Vitamin C as found in ordinary carrots, but also deliver anti-aging and general health benefits through anthocyanin and polyphenol, which are not found in ordinary carrots. Studies have shown that black carrots have 28 times the anti-oxidizing properties of ordinary carrots. Black carrots also contain around 430 µm per 100 g of beta-carotene—about 50% - 100% more than ordinary carrots—as well as around five times as much Vitamin C. They even have about 120% more polyphenol than blueberries. On this basis, the black carrot is truly the queen of all the carrots. Anthocyanin is a form of polyphenol. The term refers to a natural pigment of violaceous hue. Anthocyanin is said to be effective for relieving eyestrain, promoting eyesight recovery and preventing or slowing down the decline in visual acuity. It has a powerful anti-oxidizing effect that helps to boost the immune response and slow the aging process. It also acts as an anti-inflammatory and provides protection for the capillaries, and boosts circulatory functions particularly with respect to blood flow. Meanwhile, beta-carotene is transformed into Vitamin A in the small intestine which promotes eye health. Vitamin C stimulates and activates white blood cells, thereby boosting the immune function. Many veterinarians prescribe Vitamin C for the treatment of a range of ailments including bladder and urinary tract infections, respiratory infections and even cancers.